A cataract is an opacification (clouding) of the natural lens inside of the eye. The lens helps us focus on objects at different distances. As a part of the normal aging process, changes in the lens can cause it to become cloudy. 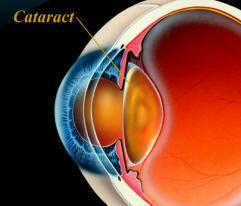 Left untreated, a cataract can become so dense that it causes blindness. In fact, cataracts are the leading cause of blindness in the world. The original meaning of "cataract" is "waterfall," and the name was chosen because distorted vision caused by a cataract reminded people of the distorted view that is obtained when looking through a waterfall. In rare cases, congenital cataracts are present at birth. These cataracts are usually related to the mother having German measles, chickenpox, or other infectious diseases during pregnancy or to the child having certain syndromes (e.g. Marfan's). Some cataracts are inherited. This is an example of modern acrylic foldable IOL. The actual lens is about one-third the size of a dime. A cataract cannot return because the entire lens has been removed. However, in as many as half of all people who have extra capsular surgery or phacoemulsification, the lens capsule (the tissue bag that supports the replacement lens) becomes cloudy. This cloudiness can develop months or years after surgery. 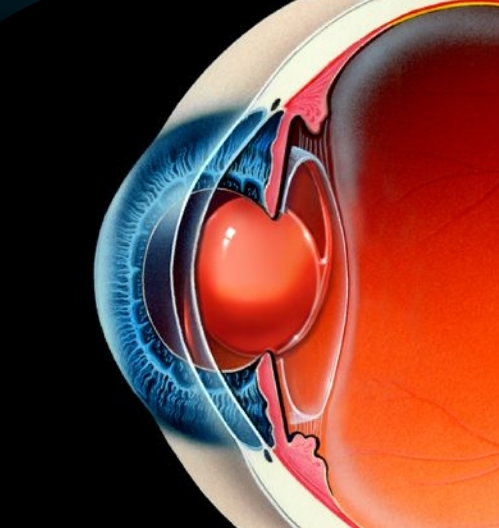 It can cause the same vision problems as the original cataract. · Age. Most Americans older than 60 years have cataracts. · Medical conditions. Diabetes and other systemic diseases, glaucoma, and metabolic abnormalities can cause cataracts. · Physical injuries. Commonly called traumatic cataracts. A blow to the eye, great heat or cold, chemical injury, exposure to radiation (usually associated with radiation therapy for cancer patients), and other injuries can lead to cataract formation. · Ultraviolet radiation (UVA or UVB). Long-term exposure to sunlight is believed to speed the development of cataracts. · Oral steroids and other medications. Oral steroids (such as prednisone), the gout medication allopurinol, the breast cancer drug tamoxifen, the heart medication amiodorone, and the long-term use of aspirin have also been associated with cataracts. · Smoking. Studies indicate that smokers are twice as likely to develop cataracts as nonsmokers and that quitting can reduce the risk for developing cataracts. No. Today, cataract patients who have artificial or intraocular lenses (IOLs) implanted during surgery may only need reading glasses for close vision. 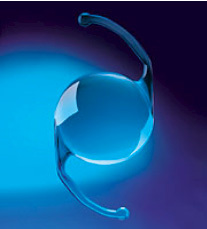 Patients who do not receive IOLs wear contact lenses for distance vision and reading glasses for close vision. Some patients choose to wear multifocal contact lenses for all distances. Medical doctors, MDs, who, after completing medical school and an internship, have had 3 or more years of special training in eye diseases and surgery, are called "ophthalmologists." Only ophthalmologists who have had special training in eye surgery are allowed to perform cataract surgery.